What would a EvE online Internet look like? It is also home to a expansive world map to hold all of these players. At its peak EvE had 63,000 players online in a single world with 500,000 paying subscriptions on top, and while that number is getting lower by the year the world remains infamously large. Meaning that to get from one side to another is a sizable amount of time (and risk due to player owned factions). I always viewed this map like a network, it’s a large mesh of systems that connect to each other so that people can get across, with most systems having more than two jump gates. this lead me to think what would happen if you took the idea of the map being a network literally? What would a EvE online internet of systems look like? For this we need to understand how the real Internet works. The internet is a large collection of ISP’s that are all numerically identified with a standardised and unique ISP number, called an Autonomous System Number or ASN ( or AS for shorter ). These AS’es need a way to exchange routes with each other, since they will own ranges of IP addresses, and need a way to tell other ISPs that their routers can route these IP addresses. For this, the world has settled on Border Gateway Protocol or BGP. The default behavior of BGP is when it gets a route from a peer, is to give it to all of the other peers it is connected to as well. This means that peers will share their view of the routing table with each other automatically. However EvE online is set in the future. Who knows if the internet still relies on this for-profit routing layout. Let’s pretend that it doesn’t so we can see how BGP scales in larger networks. For this we will need to simulate real BGP router behavior and connections. Giving that EvE has a relatively low 8000~ systems, and a reasonable 13.8k links between them. I figured it was not impossible to actually run 8000~ virtual machines with real BGP and networking on them to find out how these real systems looked like when acting together as a network. However, we do not have unlimited resources, so we will have to find a way to make the smallest Linux image possible in both disk and memory consumption. For this I looked towards embedded systems, since embedded systems often have to run in very low resource environments. I stumbled upon Buildroot and within a few hours had a small Linux image with just the things I needed to make this project work. drwxrwxr-x 2 ben ben 4.0K Jan 22 22:46 .
drwxrwxr-x 6 ben ben 4.0K Jan 22 22:45 ..
For networking I chose to use an undocumented feature of qemu (in my version), in where you can point two qemu processes at each other and use UDP sockets to transfer data between them. This is handy as we are planning to provision a lot of links, so using the normal method of TUN/TAP adapters would get messy fast. Since this feature is somewhat undocumented, there were some frustrations getting it working. It took me a significant amount of time to discover that the net name on the command line needs to be the same for both sides of the connection. At a later glance it appears that this option is now better documented however as with all things. These changes take awhile to propagate to downstream distributions. Once that was working, we have a pair of VM’s that can send packets between them with the hypervisor carrying them as UDP datagrams. Since we will be running a lot of these systems, we need a fast way to configure them all using pre-generated configuration. For this we can use a handy feature of qemu that allows you to take a directory on the hypervisor and turn it into a virtual FAT32 filesystem. This is useful since it allows us to make a directory per system we plan to run, and have each qemu process point to that directory, meaning we can use the same boot image for all VM’s in the cluster. Since each system has 64MB of RAM, and we are planning to run 8000~ VM’s, we will clearly need a decent amount of RAM. For this I used 3 of packet.net’s m2.xlarge.x86 instances, since they offer 256GB of RAM with 2x Xeon Gold 5120’s meaning they have a decent amount of grunt to them. I used another open source project to produce the EvE map in JSON form, and then have a program of my own produce configuration from that data. After having a few test runs of just a few systems I proved that they could take configuration from the VFAT and establish BGP sessions with each other over that. At first I attempted to launch all systems in one big event, unfortunately this ended up causing a big bang in regards to the load of the system, so after that I switched to launching a system every 2.5 seconds, and the 48 cores on the system ended up taking care of that nicely. During the booting process I found you would see large “explosions” of CPU usage over all of the VM’s, I later figured out this was large sections of the universe getting connected to each other, thus causing large amounts of BGP traffic to both sides of the newly connected VM’s. 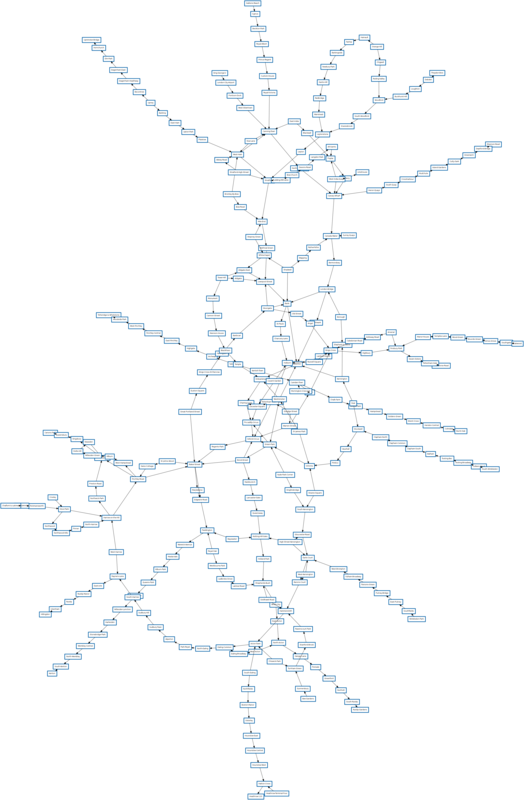 In the end we got to see some pretty awesome BGP paths, since every system is announcing a /48 of IPv6 addresses, you could see the routes to every system, and all of the other systems it would have to route though to get there. The TFL system is much smaller, and has a lot more hops that only have one direction to go in since most stations only have a single “line” of transport, however we can learn one thing out of this, we can use this to harmlessly play with BGP MED’s. There is however a problem when we view the TFL map as a BGP network, in the real world the time/latency between every stop is not the same, and so if we were to simulate this latency we would not be moving our way around the system as fast as we could be, since we are only looking at the fewest stations to pass through. And how the entire network instantly picks the next fastest route, rather than the one with the fewest stations to pass through. And that’s the magic of BGP MED’s in routing! The code for all of this is open now, You can build your own network structures with a reasonably simple JSON schema, or just use EvE online or TFL since that is already in the repo. If this is the sort of madness you enjoy, you will enjoy the last half year where I’ve been doing various other things like playing battleships with BGP or Testing if RPKI works. To keep up to date with my posting you should use the blog’s RSS feed, or follow me on twitter. I would also like to thank Basil Fillan (Website/Twitter) for helping out with the BIRD2 iBGP configuration in this post. It is worth mentioning that I am looking for a EU based job sometime in April 2019, so if you are (or know) a company doing interesting things that align with some of the sensible or non sensible things I do. Please let me know!